Rapid Rifle Covers' patented design is simple yet functional. Their unique rifle and scope cover quickly slips on your firearm protecting both the scope and rifle barrel. With a snug fit, this soft rifle cover is custom fit to any rifle, muzzle-loader or AR. 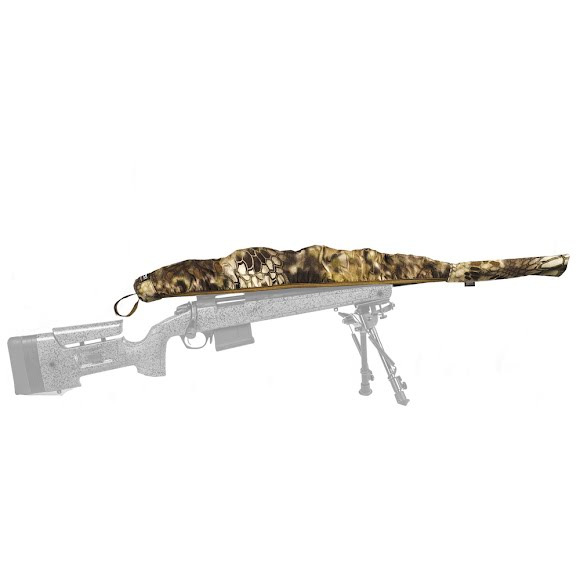 A Rapid Rifle Cover is easy to use for both a seasoned sportsman and novice. Rapid Rifle Covers &apos; patented design is simple yet functional. Their unique rifle and scope cover quickly slips on your firearm protecting both the scope and rifle barrel. With a snug fit, this soft rifle cover is custom fit to any rifle, muzzle-loader or AR. A Rapid Rifle Cover is easy to use for both a seasoned sportsman and novice. This cover will not fit rifles with muzzle breaks or suppressors. Used inside a gun case or safe, a Rapid Rifle Cover adds an important layer of added protection. RRCs can also be used as stand alone product. On a four-wheeler or hiking in the mountains, our exclusive Rapid Rifle Cover will keep dirt and moisture off of your scope and out of your rifle barrel.